Do you want to have a place to stay in the City Centre of The Hague while feeling at home at the same time? Our spacious suites offer you a place to relax, free WIFI, refrigerators and a great view of the bustling shopping streets. 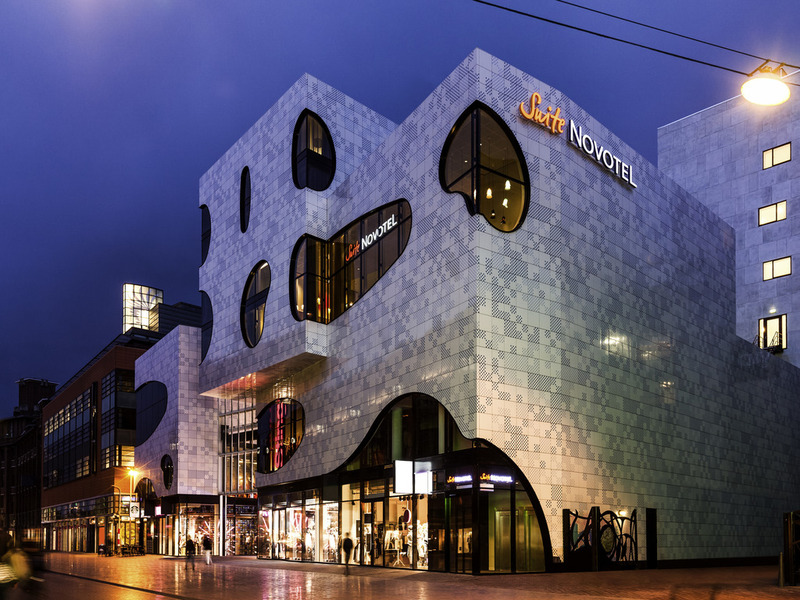 Novotel Suites Den Haag City Centre is the perfect base from which to explore The Hague, located in the city's shopping and leisure district. Visit the trendy shops on Spuistraat and Venestraat, and in the Haagsche Bluf shopping area. We can also recommend the historic attractions, such as the Mauritshuis, the Knight's Hall, and Binnenhof. For a fun day out with the children, try the miniature park of Madurodam. View The Hague in a different way and make a boat trip on the city canals. Our hotel is ideally located in the city centre and is easy to reach by public transport. There are numerous tram- and bus stations surrounding the hotel and The Hague's central train station is just 10 minutes on foot. Modern and spacious suites with microwave, TV,fridge etc. Bathroom with bathtub and separate rainshower. Cozy lounge with a great view of the shopping streets. Stay longer and get more discount. Up to 35%! Our modern suites are designed for you to work, relax or socialise. You can enjoy the view of the bustling shopping street of The Hague. All the suits are equipped with free Wi-Fi, microwave, flatscreen TV, refrigerator, bathroom with bath and rainshower. A modern suite for work and relaxation. Here, our guests can enjoy a drink and relax in comfortable armchairs. The decor, lighting and music have all been designed to help you unwind after a busy day. Nice and central hotel with comfortable room, free coffee and fruits. Friendly staff and nice extra offers like massage or sweets for the kids. Liked the reasonable price for good service. Also style makes you feel welcome. The room was clean and modern. The 5 euro return daily ws brilliant. Having access to a handy phone was awesome. Would have liked to have conditioner in bathroom. The services and facilities are good and cozy. Staffs are friendly. Besides that, I am waiting for e-receipt to my email address which hasn't yet been set to my email address. I am wondering if you could send it to my email address shortly please. A very satisfying concept, reception desk, hall and dining room all together. Perfectly located in the heart of shopping area and restaurants, near to the central station and offering coffee at anytime. Rooms big and confortable. We had a great stay- we have been a few times to this property and each has been very good. The staff were very welcoming. The rooms are an interesting design and work well for families with kids. Nice, modern hotel! Great location in the centre! I really liked the location and despite the hotel being right on a busy shopping street it was really quiet in the hotel and my room. The bathroom with the waterfall shower was perfect. In other reviews, I read that the beds were very hard, but with the topper I do not share that opinion. The beds were comfortable. Breakfast offers quite a variety of products and the lobby is all very nicely decorated to enjoy your breakfast. What I really liked was the possibility to indicate whether you don't want your room to be cleaned in exchange for an 5 EUR voucher in your shop. This gave me as a guest an incentive, and also shows that the hotel is trying to help the environment and innovating how to achieve this. When I need to go back to The Hague, I will for sure book a room at this hotel again. I've been visiting the Novotel Suites for the last few years and was happy with the service. Unfortunately, at some poitn in the last year or two, the policy changed for the free wifi to be artificially limited and for the higher-speed to be charged separately. This is truly unacceptable and I'll be looking elsewhere for accommodation next time I'm in Den Haag. The hotel ist located in the heart of den Haag downtown area. The rooms are spacious but suffered from cleanliness. Very happy with our 2 night stay, we booked this hotel as a treat for my 50th, although they have to revalidate our card keys again on the second day as they make a small error of checking us for a night only but this was quickly rectified. Love staying in the Novotel Suites as always. The only point for improvement is around the laundry. There was never a laundry bag or sheet in the room. Additionally laundry always took a minimum of two days. Most hotels turn it around in a day. Have been here a number of times, both on business and privately. Each time is great. Clean, modern rooms and friendly staff.